Does Santa ever get stumped on what to put in the stockings? I’m sure he gets tired of those cheap (or not!) toys the kids barely pay attention to before ripping into the real stuff. What about something the kids will actually love? This is simply my original easy recipe for homemade playdough jazzed up with a little peppermint extract. The result? A super fun DIY stocking stuffer the kids love that costs you (or Santa) just pennies. It’s a win-win! Here’s the step-by-step directions. It may look daunting, but believe me, it’s not. If I can successfully make multiple batches while trying to grab my almost 2 year old off the kitchen table, wiping up spilled water from my 3 year old, and breaking up a fight between my older two, you can definitely make it. It’s actually kinda hard to mess up…of course you do have to read the recipe and use the following ingredients. And it’s easy enough for your kids to help or even make it themselves! My 10 year, Nathan, has made several batches with me only supervising. One batch of this homemade playdough will make approximately 4 store-bought containers worth. *One common question I get is how do you get such vivid colors? I use AmeriColor food color. A little goes a long way and it lasts forever! 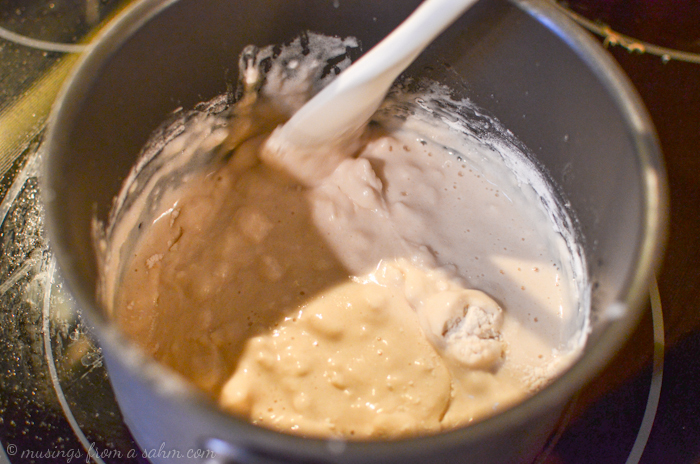 Mix the flour, salt, and cream of tartar together in a 2 quart saucepan. Add the water, oil, and peppermint extract to the flour mixture. Enjoy the peppermint smell! Turn on the burner to medium/low heat and stir. Lumps are ok. If you don’t break them up all up during this step – and I often don’t – you’ll work them out later because it’s well…playdough. Believe me, the lumps are a good excuse to have some fun testing the playdough out yourself…. Keep stirring until the mixture starts feeling a little more solid. You can tell when it starts separating a little at the bottom of the pan. This could take anywhere from 20 seconds to 2-3 minutes, depending on how hot your stove is. Add the food coloring right away. The playdough begins to solidify quickly from here, so it’s easiest to mix the food coloring in just before that point. If you miss that window of time, it’s ok – your playdough will still be fine. You’ll just have to work the color in by hand once it cools later and that can be a bit messier. See how it works together into a ball? And you can see how I still have some lumps in there… that’s ok – I worked them in later. Now dump the ball of playdough onto a plate or piece of waxed paper to cool. It won’t be super hot, but I usually let it cool for about 5 minutes before kneading it to get any lumps or food coloring mixed in completely. Your homemade playdough for Christmas is done! I like to store our playdough in ziploc bags. Just make sure you let the playdough cool completely before zipping those bags tight or you’ll end up with moisture inside that can potentially mold your playdough. 1) Reuse old store bought playdough containers. , wrap colored saran wrap around, and tie with a ribbon. You don’t have to limit this to just a stocking stuffer. Make a bigger batch and give your child playdough as a regular gift too! It’s perfect for any child on your gift list, really. from the store – they seal tightly so you don’t have to use ziploc bags (still recommended if you make different colors.) And with it’s very own handle, kids will be in heaven with their homemade playdough for Christmas! Questions? Check out the Easy Homemade Playdough FAQ page! This easy homemade playdough for Christmas takes just 5 minutes and 6 simple ingredients to make! It’s a perfect homemade Christmas gift or stocking stuffer that kids will love! Add the water, oil, and peppermint extract to the flour mixture. Add the food coloring right away. The playdough begins to solidify quickly from here, so it’s easiest to mix the food coloring in just before that point. I love making homemade pay dough for my kids. It is Great to have on hand. I’m so glad I came across this post! I have been talking about making Play-Doh! I even went out and bought Cream of Tarter just to make it. That was months ago. I might not be able to get it as bold as yours but that is okay. We buy so much Play-Doh. This will be fun for the kids! I’m bookmarking this so I don’t lose it. This is a great idea to give out to preschool classes as a special holiday gift. Cost effective too – Happy Holidays! We made the playdough and it wzs a great easy recipe. My 4 and 6 yr old managed it with assistsnce at the stove. Now we are going to turn it into a volcano and make fizz inside from another recipe. Wish us luck!